There seems to be a bit of a dichotomy going on: some companies are on the high side of the price ranges continuously, whereas others are consistently on the low side. Any way you slice it, the 2400 C10 kit from Corsair in this review is too expensive, especially when a similar specification kit is $80 cheaper. Thank you to OCZfor providing us with 1250W Gold Power Supplies. Thank you to ASUSfor providing us with the AMD GPUsand some IO Testing kit. Thank you to ECSfor providing us with the NVIDIA GPUs. Thank you to Rosewillfor providing us with the 500W Platinum Power Supplyfor mITX testing, BlackHawk Ultra, and 1600W Hercules PSUfor extreme dual CPU + quad GPU testing, and RK-9100 keyboards. Thank you to ASRockfor providing us with the 802.11ac wireless router for testing. In our Haswell memory overview, I introduced a new concept of ‘Performance Index’ as a quick way to determine where a kit of various speed and command rate would sit relative to others where it may not be so obvious. As a general interpretation of performance in that review, the performance index (PI) worked well, showing that memory kits with a higher PI performed better than those that a lower PI. 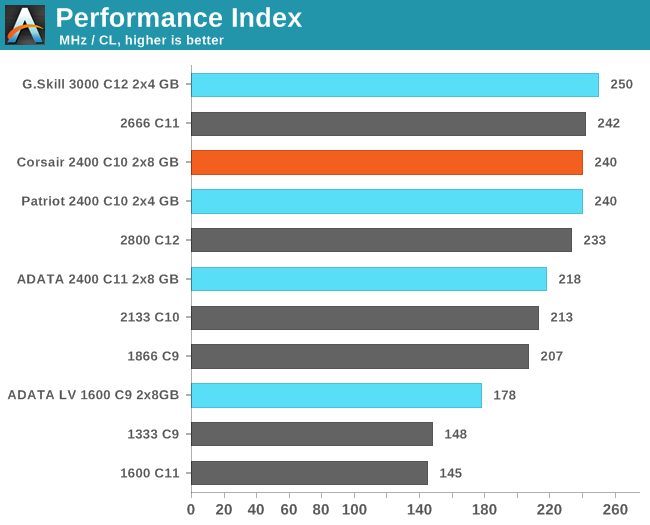 There were a few circumstances where performance was MHz or CL dominated, but the PI held strong for kit comparisons. Any kit 1600 MHz or less is usually bad news. That final point comes about due to the law of diminishing returns – in several benchmarks in our Haswell memory overview performed very poorly (20% worse or more) with the low end MHz kits. In that overview, we suggested that an 1866 C9 or 2133 C10 might be the minimum suggestion; whereas 2400 C10 covers the sweet spot should any situation demand good memory. From the data in our memory overview, it was clear that any kit with a performance index of less than 200 was going to have issues on certain benchmarks. The Corsair kit has a PI of 240, which is at the higher end of the spectrum.